Clover is a daughter of our much loved Alice (Ch Bonnymead Alice Bluegown) and Barney, (Aus/UK Ch Collooney Silver Jigolo - who visited Oz from Ireland). She is a soft and gentle girl, always wanting a cuddle. 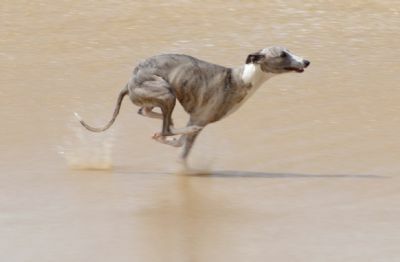 Clover is all whippet, standing over ground and with a big gait which has been well recognised and rewarded by specialists, local and international judges. Clover gained her title in May 2007 at 13 months of age! 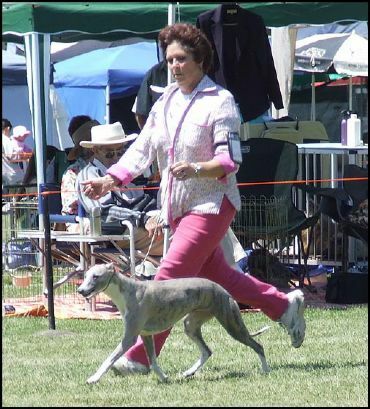 She attained her Grand Championship title in November 2010 and her Supreme followed soon after. Her first litter was born in early July 2009 and we were thrilled with the puppies sired by Cooper (Ch Peperone New Sensation). Her second litter was to Ch Byerley Hilfiger. Her next litter is due early in 2014. Clover has gone from strength to strength rarely out of the awards. She may be plain in colour and markings but there's nothing ordinary about Clover. 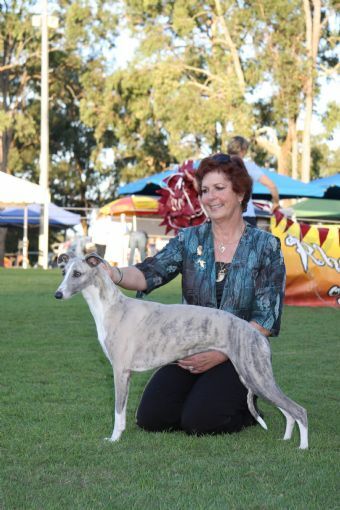 She may be a Multiple Best In Specialty winner and RUBIS at the 2nd National, and a BIS all breeds winner, but she is first and foremost a lovely dog to live with.